Who’s who in the ark outfit? Today I had JSL in one of NHL’s old outfits. This evening I decided to prop him on the couch to get a photo similar to one that I had of NHL in the same outfit. Here’s the comparison. So do you know which is which? Here are the stats about the photos. –> NHL’s was taken 12-14-2003 when he was almost 4 months old. 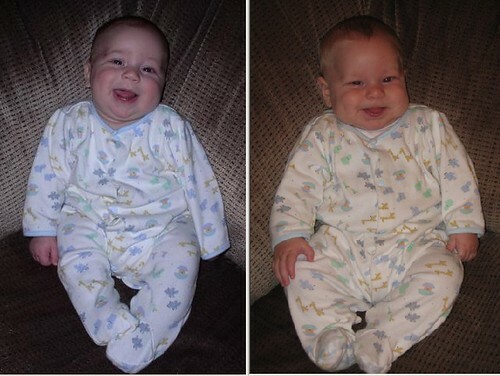 –> JSL’s was taken today (10-1-2007) when he was about 4 1/2 months old. Let me know if you can tell the difference. NHL is on the left. JSL is so cute! He’s definitely got that “baby” look now, no more newborn squishiness. And he’s got The Cheeks. Oh, they are definitely brothers, but I think they have their own look. J is a lot chubbier than N and seems to have a different complexion. Both, however, are just way too darn cute!! Nancy: Yup, you are correct! NHL is on the left and JSL on the right. No, the newborn look is definitely gone from JSL. *sigh* It’s great watching him grow, but sad at the same time. Sarah: Correct! I fixed the posts for you and combined to one. You can’t edit posts within a blog comment section. Sandra: No doubting they are brothers. Although similar they are very different – especially personality wise. JSL has the huge cheeks and dimple only in one of them, plus the chin dimple. The complexion is more the different camera settings (different camera from 4 years ago).